Hummus or houmous is made with chickpeas and tahini. It is a very healthy side dish which can be served with seasonal vegetables and bread of all sorts. Soak the chickpeas overnight and cook with the onions the next day for around 1 hour or until soft. Drain, but keep the water. Cook the beetroot for around 45 minutes to one hour, depending on size. If a fork goes in easily and the skin comes off easily, they are ready. Top and tail and peel the beetroot. Slice in cubes. 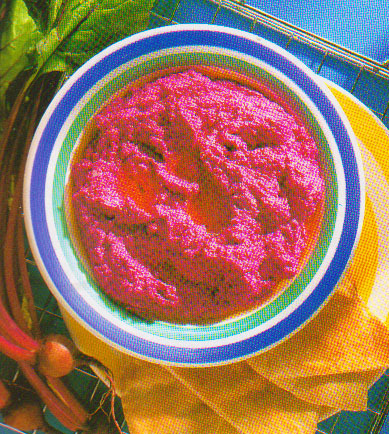 Put the beetroot, chickpeas, onion, garlic, tahini, lemon juice and ground cumin in a kitchen machine and puree until it is one paste. You might need to do this in portions. Slowly add the olive oil and enough of the kept water to make it a spreadable consistency. Make sure everything is well mixed and pureed! Serve with naan bread, toast or pitta bread or gluten free bread. Add a little ground salt on each toast.